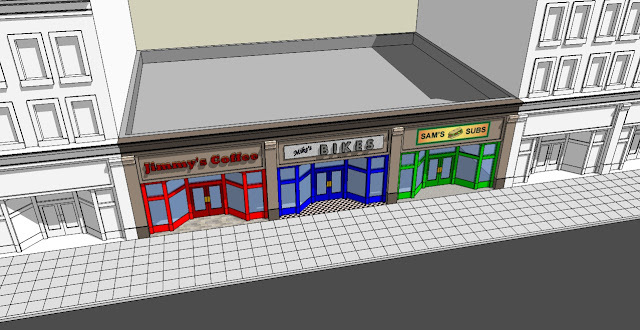 Downtowns all over America are filled with small storefront buildings such as the one in the sketch above. They are on narrow, deep lots and often have two or three simple storefronts. Many of them fell into decay as sprawl deadened their neighborhoods and as retail switched to large, corporate, car-oriented formats. As our downtowns become popular again, they are prime candidates for rejuvenation. Signs. Often, there is an impulse to give all of the signs on the building a uniform appearance. Sometimes this is encouraged by the local planning department, other times it is initiated by the building owner. I suppose the idea is to present the building as a single unit. This might make sense in a suburban shopping center, which is experienced as a single self-contained thing, but downtowns don't work like that. A block might have four or five of these buildings, and passing pedestrians may not even notice where one building ends and the next begins. To a downtown shopper there are only two important increments: downtown as a whole, and the individual businesses. Intermediate scales, such as blocks and buildings, shouldn't be the focus of our sign designs. It is more important for each shop to stand out, and to catch the attention of potential customers as they pass by. Paint. Don't change colors right down the middle of the pilasters between the businesses. This looks sloppy and unappealing. Rather, paint the columns, spandrels, cornices, and other such building elements in a unified color scheme. Paint jobs should never fight the architecture of the building (think of San Francisco's painted ladies). The storefronts--the area between the pilasters--should be painted in bright, fun colors which vary significantly from business to business. Windows. Do NOT tint your windows or obstruct them in any way. Don't do it. It is very important that passersby be able to see into the shop, to see the merchandise and to see people inside having a great time. If your shop gets pummeled by the afternoon sun, then get some blinds and put them down only for for the hour or two per day when there is a need. If people can't see in, then they'll walk on by. Entry Tiles. 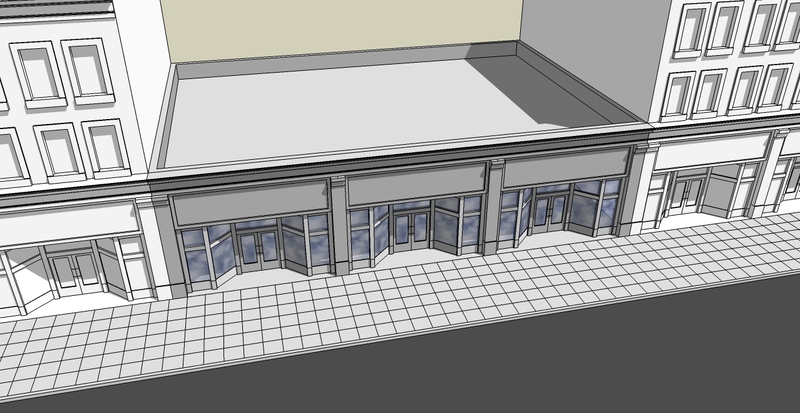 Most storefront doors are set back a bit from the sidewalk to accommodate the door swing. Pull people right in by having some fun with this area; use colorful, attractive tiles which vary from store to store. Paint that fights the architecture; blacked out windows; and dull, unified signage. clear windows with appealing displays and views; and interesting signage. Marketing your business is very necessary and that should be done with use of proper signage for your shops. The signage that you are using should fulfill three necessary things and they are attracting new buyers, branding of your business, creating desired sales. Signage is the first thing that comes in contact with the customer, so it needs to striking and eye catching with vivid colours according to your business. I think everyone should follow this idea of not painting the architecture of the building. In this way you can attract potential buyers to your shop.